If you want to write effective procedures, there are some specific planning activities that will result in better, more useful procedures. Basically, the advice I have in order to write effective procedures is the same advice I would give anyone taking on any kind of writing project – from a college term paper to a novel, a business letter, or a procedure; craft the writing project by working through a process that includes three phases: Plan — Draft — Revise. Extensive research has shown that writing projects of any kind tend to be successful when writers use the process approach and engage in some type of activity from all these three phases. The type of activity doesn’t always have to be the same — it should be appropriate to the type of writing project and the personal preferences of the writer. But it is clear that successful writers do some type of planning activity before they draft their work, and then they engage in revision activity. In this article let’s cover the first step in the process — Planning. Speaking generally, planning consists of activities like research, brainstorming, diagramming/outlining, reflection, and free-writing (stream of consciousness writing as an idea generation or reflection activity). 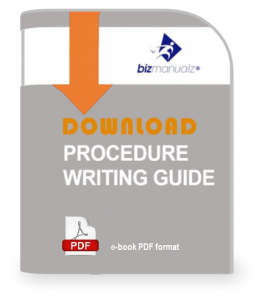 If you want to write effective procedures, there are some specific planning activities that will result in a better, more useful procedure. A key planning activity for writing effective procedures is to understand the process that the procedure will document. That starts with research, or in other words, collecting information. This would include doing things like interviewing process owners and process doers. In technical writing terms they are the Subject Matter Experts. They are the ones who know and understand the process, and a large portion of the information should come from them. All the information, however, shouldn’t come from those directly involved with the process. Another key source of information should be exploring current and obsolete documents related to the process (old procedures, related procedures in other areas of the organization, product specifications, customer requirements, etc). There you can find key information about the process that needs to be preserved or perhaps even restored. Research should also be conducted outside of the organization. Is there information available from experts or from industry leaders about best practices regarding the process or related activities? Learning and incorporating best practices (modified as needed to best fit the unique organization) should be a key goal of documenting any process, but it takes effort to locate and incorporate this kind of information. As you work to understand the process, make sure you identify and understand the key aspects of the process. Inputs: Who are the suppliers (external or internal)? What are the inputs and what format (for example) should they be in? Are there critical paths and timing that are crucial in receiving inputs? As you work to understand the process, make sure you identify and understand the key aspects of the process. Activities: What are the key activities that must be performed in order to transform the inputs into the needed outputs? What are the timelines and chronological components? Who are the key players? Try to identify excessive waste or inventory and unnecessary delays; what might be potential solutions to these process issues? Outputs: What is the ultimate point of the process? Who are the customers (external or internal)? What are the requirements for the outputs? What criteria related to the outputs can help determine if the process is successful and/or in control? Goals and Objectives: Goals and objectives help determine if a process is effective and efficient. Ballistic processes run on and on without any reflection or attention to how well the process functions. No one knows if the process is achieving objectives. Is this how you want your business or department to run? Controlled processes have clearly defined objectives, measurements that relate to the objectives, and regular reviews on performance and improvement efforts. Research should help define objectives by learning process capabilities and by learning how well industry leaders perform in these areas (bench-marking). Communication: Lack of useful, meaningful communication is a serious problem in many organizations, and perhaps it is one of the larger impediments to success. Those of us who work in organizations see it all the time: Sales doesn’t know what Marketing is doing, Production doesn’t know what Product Design is doing, and vice-versa. This lack of communication leads to expensive waste and rework, as well as to very unproductive last minute scrambling. Identifying the needed communication and building it into the process can lead to significant improvements in this area. 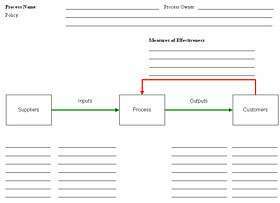 Once the information gathering is complete, using tools such as process maps, flow-charts, outlines, and value streams can present the information in a meaningful format that illuminates process, product, and/or information flow. It doesn’t really matter what method is employed, as long as it is useful and meaningful to those leading and executing the documentation (writing) process. So if you are starting a writing project of any kind, including writing a procedure, and the first thing you do is sit down at the keyboard to start typing the document, then you are making a serious error. Creating a document should come naturally from what you have learned from the planning phase. Skipping directly to drafting almost ensures your writing project will not be a success.